Have you heard of Invisalign yet? If you’re experiencing smile dissatisfaction due to the poor aesthetic condition of your teeth, it may be time to learn a little more about it! 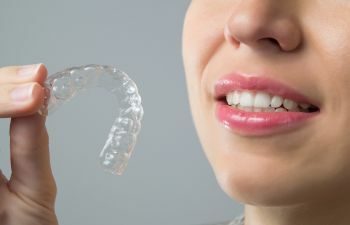 Invisalign uses clear aligner trays to safely, painlessly and clearly correct your tooth issues such as misalignment, gapped, or over and under bites. Not only will Invisalign deliver you with a straighter and more attractive smile, but it can also prevent malocclusion. Malocclusion can occur if you have mismatched teeth, which leads to a bad bite. It can result in crooked, crowed, or protruding teeth. Malocclusion may lead to something called periodontal disease. This disease refers to any infections of the structures around your teeth. It does this in several ways. If your teeth are crowded there can become a buildup of plaque and tartar. This buildup houses harmful periodontal bacteria. If you have spacing issues food may become lodged between your teeth and you run the risk of sore or tender gums. Other bites such as deep, cross, edge-to-edge, and open bites can lead to premature wear, trauma or bone or tooth loss. All of these issues can lead to periodontal disease. Periodontal disease is not only bad for your teeth, but it’s bad for your overall health as well. If it is left untreated you may run the risk of atherosclerotic cardiovascular disease, which is a hardening of the arteries. Ask our dentists at Mansouri Family Dental Care & Associates if Invisalign is an option for you. You will have amazing results. Contact our office today.